Who is loved more after death? 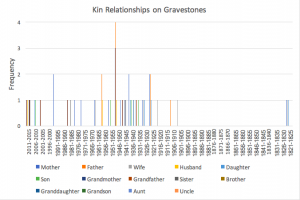 In researching the usage of kinship terminology in epitaphs I discovered from the data gathered by our class that: Mother is recorded 16 times, Father is recorded 14 times, Wife 5 times, Sister 3, Daughter 7, Grandmother 2, Aunt 1, Husband 3, and Son 4. The use of Father as an epitaph occurs most during the time period from 1945 to 1960. On the other hand Mother ranges from 1821 to 2006, with no discernible time period where it occurs the most. Wife seems to be used in the early 1900’s, while husband seems to be used more in the 1950s to 1960s. Daughter and son are both less frequent that Mother and Father, but seem to be used from 1821 up until 20015, at varying intervals. 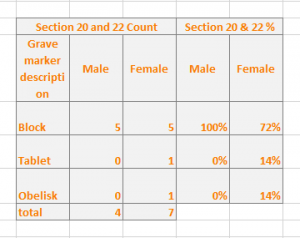 From comparing the data, there isn’t one set shape for any of the gravestones, although many independent of the epitaphs are block or tablet shaped. And the material composition of the gravestone and the use of particular kinship terminology don’t seem to have any strong correlations between the two. Although it can be assumed that many of the gravestones are wither made out of marble or granite, as earlier analysis showed that those two materials were used the most in making gravestones. Overall the data shows that women, especially Mothers are more likely to have epitaphs stating their relationship to those who bury them. Although Fathers are not far behind. These two kinship terminologies make up 55% of the epitaphs regarding kinship within the data collected. And terminology regarding women make up 62% of kinship related epitaphs. 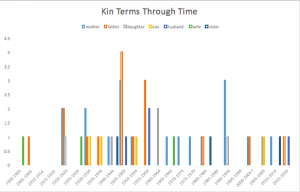 Graph displaying Kinship epitaphs and the years which they were used. The most enlightening information I gained from this project was just how absurd Excel and technology can be when trying to graph information, and attempting seriation by hand is not advisable. It’s interesting to see spikes in the term “Father” yet observe that “Mother” is still used more often. The spikes are between 1945-1949 and 1955-1959. Seeing that almost half of the occurrences of the term “Father” occur in these specific times, it may indicate that either more fathers were being interred, or it was more popular to emphasize this kinship at those times, whereas mother is a more constant term being associated with the deceased. I wonder what this means in regards to how we see women in our lives, and women in our family history. Is there really that much more emphasis on how they’re related to the living, or does this sample skew society’s view of women? 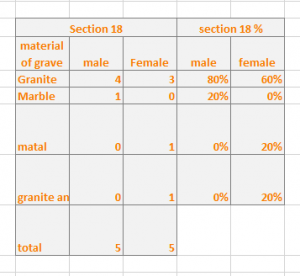 In our current lab project we are evaluating grave markers with data that we have collected within a group of 3. 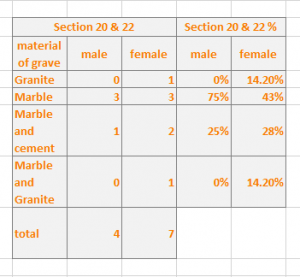 The section of the cemetery that I collected data from was mostly infant grave markers which is very sad but I thought it would be interesting to see the differences in style between my section and my other group member’s sections which are mostly adults. I choose to focus on style using only two characteristics: grave marker shape and material of grave marker. 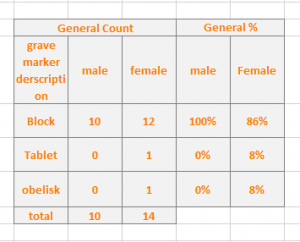 When evaluating the data I discovered that Infant gravestones where less diverse in style. The only gave marker shape that infants had where block shaped where as the grave markers for adults where either block, tablet and obelisk shaped. The Infant grave markers where also made with cheaper material usually granite where as adults where mostly made of marble. 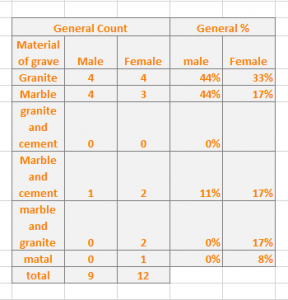 Next I separated the data based on gender and found that the majority of diversity came from female grave markers. Females had more tablet and obelisk shaped grave markers while also using a larger verily of materials within there grave markers. This trend is less prevalent within the infant grave markers but still present. Overall, infant grave markers have less style than adult grave markers and male grave markers have less diversity in style than female grave markers. 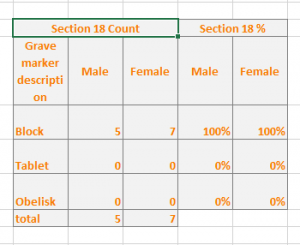 note: some grave stones where excluded from my data because I could not find figure out the gender or grave marker shape/material of grave marker was not listed. I happened to find myself in Calvary Cemetery on a crisp cold January morning, tasked with recording data of gravestones, I finished scribbling down some notes before taking a moment to enjoy the golden rays of the sunrise fall over the view of U-Village. Cemeteries can be some of the most peaceful, beautiful places in our sprawling metal and glass cities. They are very much tied into human antiquity, while the city is built up and torn down around, the heavy stones stand strong in the cemetery, every one a signature of a life passed on. After reviewing the compiled data, it is evident that human life ebbs and flows throughout time. No one period of time had the same style or type of stone, each stone holds information of who is buried there, who they loved and who loved them, what was going on in the world at the time, and so much more. 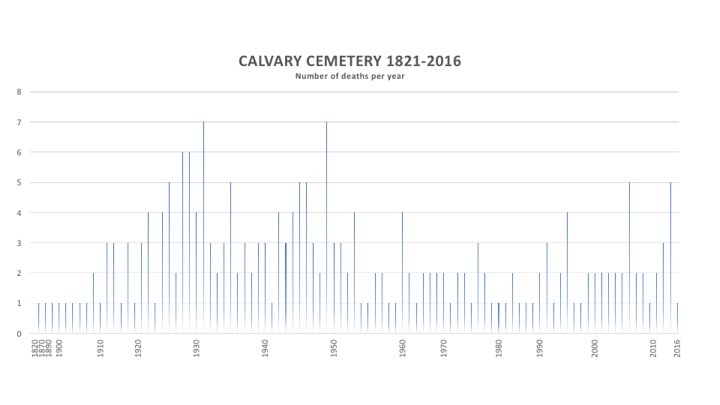 The spike of deaths from 1920 to 1950 stands out very clearly in the histogram below, why this influx of burials during this time? Well, WWII and the adverse effect it had on the world is the clear answer, however other leading factors may have included; influenza, tuberculosis and a number of other diseases. It is quite interesting the way local graveyards show signs of world wide events. 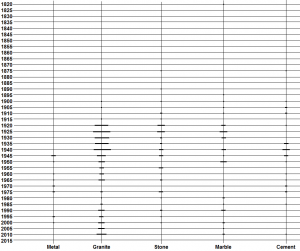 The following chart accounts for frequency of gravestone material types compiled from our class data. It reflects the frequency of death as well. 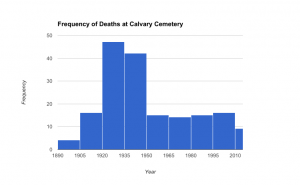 During the 1940s it is interesting that there is a small spike in cement, which might account for the large amounts of burials happening in the 1940s and possibly the inability to afford higher-end stones for a portion of the population. Cemeteries are a fascinating way to view the changes in a city, cultures, and belief systems. As the focus of our class project, Calvary Cemetery in Seattle is not only a peaceful and beautifully kept place, but also a wealth of information from an academic perspective. While it certainly doesn’t reflect the entire story of Seattle from the late 19th century to the present, recording information from nearly 200 graves out of thousands still presented patterns in the cemetery’s history. 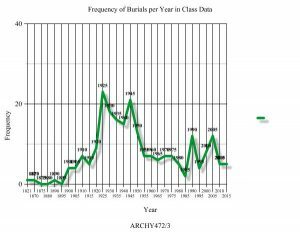 Focusing on the number of burials per year within our records, this information could represent a number of events in Seattle’s history. The numbers of burials rose after the Great War and in the early 1920’s, spiking from 1925-1930 and again in 1945-1950. While the rise in deaths could be associated with the WWI or II, the Stock Market crash of 1929, or the subsequent Great Depression, it also could reflect the rising population of Seattle in these periods. 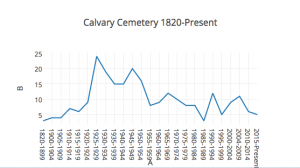 The layout and numbers of burials in the cemetery could also reflect this rising population, and the tapering off of burials in the latter half of the 20th century more as a question of limited space. I did find it interesting that large portions of the cemetery did not adhere to east-facing gravestones, which can be found in some Christian burials. On the other hand, the data collection could also be more suggestive of stylistic elements of the gravestones chosen for recording. Inscriptions, unusual design features, age, or intricate carvings on markers could have all influenced the recorders’ choices. Like many aspects of cemeteries, sometimes burials and our continued interest in them is more telling of the living than it is of the dead. In later dates, gravestones of women were somewhat lacking permanent adorn or design, such as a cross or other religious motif in comparison to male gravestones, which are more detailed and descriptive. For instance, a gravestone in St. Matthew says, “Beloved Marie” and unfortunately doesn’t have her last name on it. She passed in 1926, and the gravestone is somewhat small. In St. James, one large cenotaph reads, “In loving memory of William Chochrane” who passed away in 1911. Near the cenotaph, there’s one footstone with William and his wife’s name, as well as three other headstones. Two are female, and one is male. The male headstone has his name almost fully spelt out, except for his middle name: “William F. Cochrane Jr.”. Birth and death dates are also shown on William Cochrane’s footstone. The females’ footstones simply say, “Mary E.” and “Sue E.” with their birth and death dates. While the male footstone is more descriptive, the three footstones are similar in size and shape. In St. Matthew, one gravestone of a single male “Albert. A. Amodel” has a cross design to the left of the name, and is a little bit larger than the “Beloved Marie” footstone. The rest of the female’s footstone reads, “Died Mar. 5, 1911. Aged 28 YRS”, while the male’s footstone reads, “Nov. 9, 1921 – June 25, 1972 In the Lord, I put my trust”. The male footstone here is much more detailed, and implies religious beliefs. A possible explanation is that the female footstone is from 1911, and the male footstone is from 1972. Her family might not have been able to afford a more descriptive gravestone. There’s also a large tablet in the St. Joseph’s section for a male who passed in 1900. It reads, “In memory of Thomas Mathew Corbett Born Feb. 22, 1889 Died Aug. 3, 1900”. This is not only a tablet which is seen without walking directly up to it, but it is written in remembrance of the male who passed away. The dates are written out, and not simply years. His name is also fully spelt out. Looking at these gravestones, it appears female gravestones lacked permanent adorn or design, while male gravestone are more detailed and descriptive. 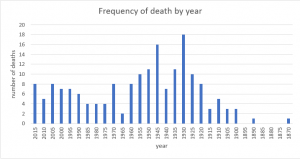 When looking through the data, the two 5 year increments that contained the highest number of deaths were the years 1930 and 1945 with the years leading up to 1930 increasing and the years following 1945 decreasing. So what can be gained from this? Well, we can clearly see two major events going on. The impact of the first World War with the coming impact of the Spanish Flu, and the onset and impact of the second World War. As soldiers came back home from all over the world, the flu took its impact on many of the populations whose countries were involved in the war. Then with the end of World War II we get the steady decrease of deaths due to the end of the major impacts of the two wars. As well as the impact of these two wars, we also see the surrounding impact of the Vietnam War and other events of the time as well as the ending of a generation with deaths increasing as we leave the 20th century and the war generation. Though cemeteries are usually a place of quite reflection and respect, much can be learned by simply walking up to and seeing who the marker represents and from what time they came from. In 1889, the Calvary Cemetery was blessed by the local bishop to formally become a Catholic cemetery. Various of the sections are name on behalf of saints, with one section called ‘Our Lady of Sorrows’. It appeared to me the most neatly organized section. However, it was not an area of focus. As a class, we gathered data from various other sections with each individual in charge of collecting information from 15 gravemarkers. According to the site, there are over 40,000 people who have been laid to rest in this particular cemetery. Our data consisted of nearly 200 gravemarkers. Minimal, but there was much to learn. I focused on the number of deaths per year, noticing a gradual increase from the early 1900’s until 1930’s and again from the 1940’s until the 1950’s. This fits in with not only the end of the world wars, but also before the mass production and availability of penicillin, one of the first antibiotics.Although there is a spike in deaths in 1949, in the years to follow there is never as a high of a spikes with deaths per year averaging our between 2 or 3, compared to prior 1950 the average being 3 or 4. After the accidental discovery of penicillin there was a wave of new medication that occurred that has increased life expectancy. In the 1950’s, for both sexes it was on average 68 years. Today, life expectancy on average is 78.8 years. Our data is an excellent representation of the effect medicine has had on the human population in the past years.